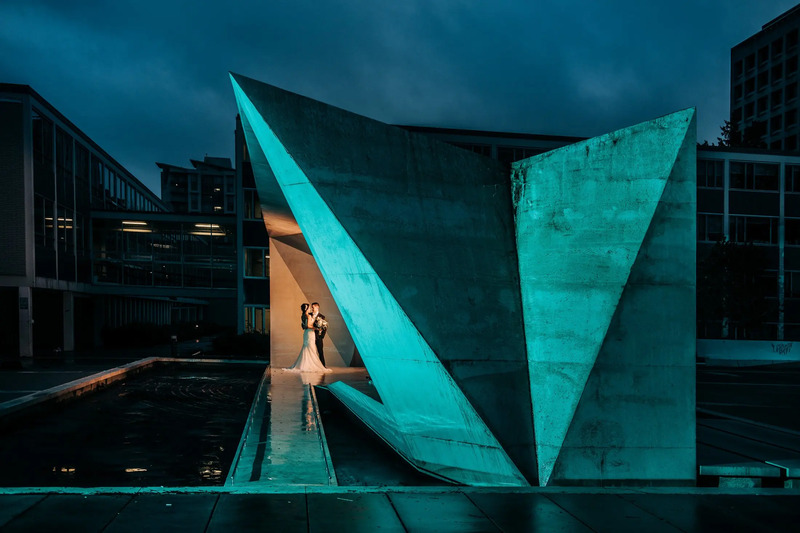 This amazing couple decided on an intimate winter wedding at UBC. 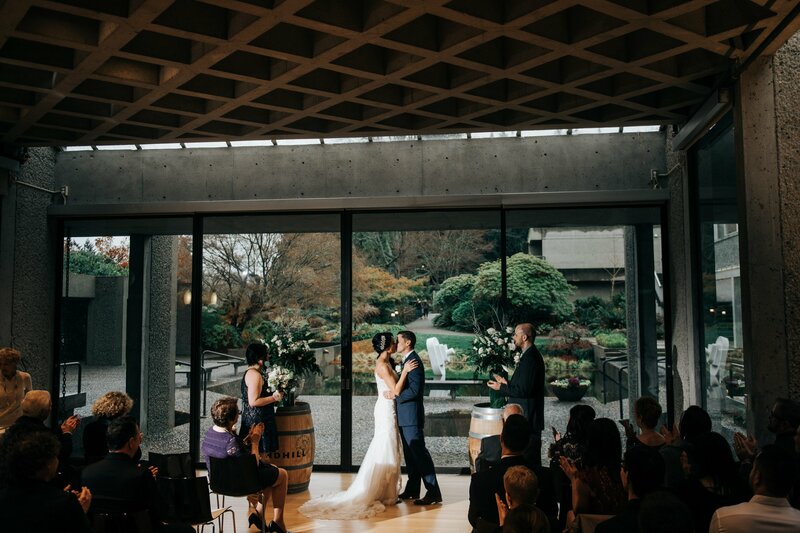 They had their ceremony in a little room at the Sage Bistro building, where it had big windows that looked out onto a little courtyard. In Will Pursell fashion, during the ceremony, he jumped outside in the rain to get a bit of a different perspective from the outside in for the walking down the aisle shot, and it really paid off. The reception was in the main area of Sage Bistro, where they had candles on each table and really gave the whole reception a beautiful, romantic ambiance to it. 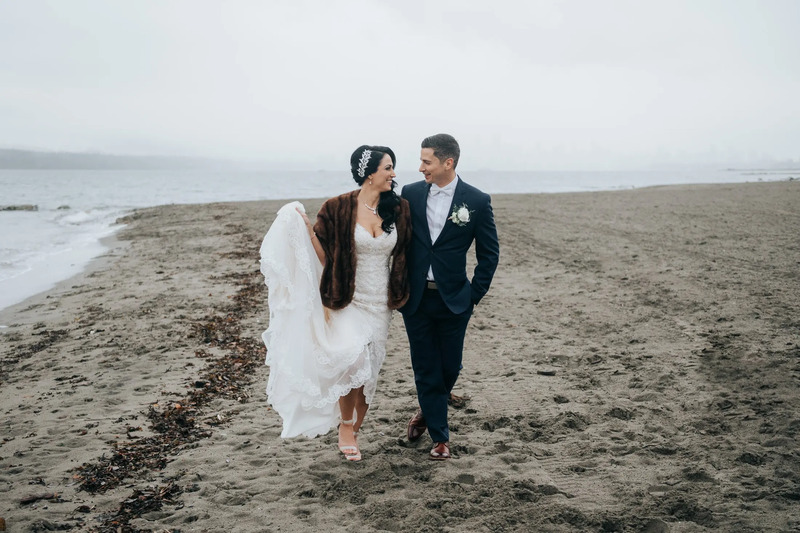 For the portraits, the couple really liked Jericho Beach, and wanted to go there rain or shine. It stopped raining just as we started taking photos for a few minutes, so we could use the beach without using umbrellas, and take in some of that view. The clouds were hanging low that day, but it gave the scene a really cool look to it with the city barely visible in the background. When it started raining, we moved to an art structure at UBC and really took advantage of the pouring rain to come up with some of our favourite romantic rain photos from the season. Winter weddings are often darker with shorter days, the weather can be challenging with rain or snow, and that may be a turn off for some, but we actually love it and embrace that time and come up with some new poses and dramatic lighting techniques that we have never done before, in order to really take advantage of these moments. Our couple’s react really amazing to our style and how we photograph these winter weddings, and that is a pretty awesome feeling to have. This couple embraced every moment of having us there, and we really had a lot of fun running around in the rain with them!